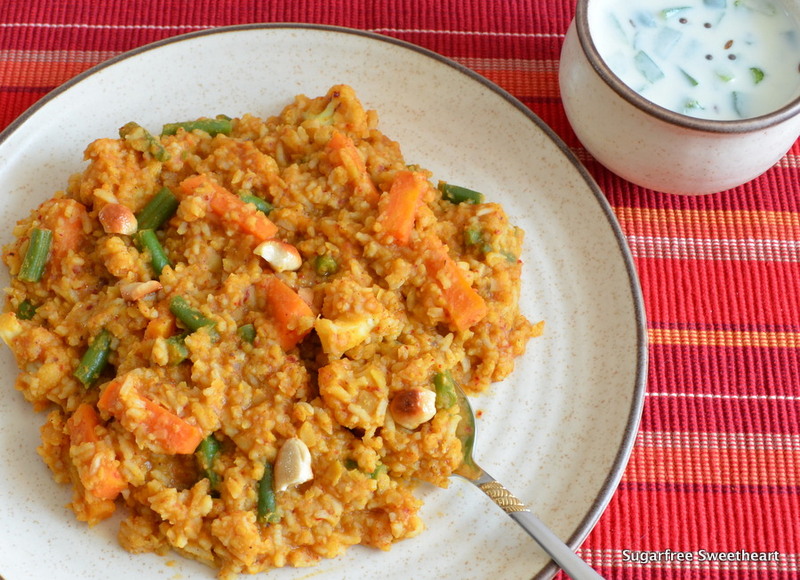 Bisi Bele Bhath, which is literally Hot Dal Rice in Kannada, is a complete meal with dal (protein), rice (carbs), vegetables (nutrients), and a fragrant, layered, spice mix that brings it all together for a tasty, filling, nutritious meal. I have to admit, till very recently I used the store-bought spice mix for this dish and used to wonder why Mom’s version was soooo much better. In honour of Diabetic-Friendly Food Week I decided to make this recipe in it’s fully authentic version — for me that’s Mom’s version, of course! 🙂 So I followed her recipe for the spice mix and we were pleasantly surprised at how yummy it was! The freshly roasted spices smelled heavenly. This dish is usually served with curd or raita and if you are in a restaurant – some potato crisps (I know!). The restaurant versions of this dish also tend to be a lot more soupy and, depending on which part of Karnataka you go, either a little sweet or rather spicy. Bisi Bele Bhath is best eaten fresh and hot, but also makes for very good left overs that can be easily warmed up. This recipe is suitable for diabetics, weight watchers, lentil lovers, and spice savourers! Time to make Bise Bele Bhath from scratch! Use the store-bought spice mix for when you are in a hurry and you can make a quick, healthy, and complete meal. At all other times, make your own spice mix! It’s seriously awesome. Use more of tur dal if you don’t have any channa dal for the spice mix. If you don’t have a steamer or microwave, cook the vegetables in the pot itself along with the spice mix and a little water. It’s time to think healthy and cook healthy, and send in your diabetic-friendly recipes! We’ve got a couple of entries already, thanks to Sonal of SimplyVegetarian777 and Divya of ChefDivya! Do check them out here. One of my favourites…. I can eat it anytime! 🙂 Loved reading each post of yours…!!! I love this tasty recipe a lot & this is my dinner for tomorrow!!! I Will add fried chicken.